Dr. Laskin is the Co-Chief of the Knee Service at the Hospital for Special Surgery in New York City and is Professor of Clinical Orthopedic Surgery at Cornell Medical School. His practice is limited essentially to total knee and total hip replacement surgery. Since 1973, Dr. Laskin has performed more than 4000 total knee replacements. Knee1: Over the years, how has the total knee replacement procedure changed? Dr. Laskin: A total knee replacement (TKR) consists of some sort of a metal surface on the femur and a plastic surface on the tibia/patella. The metal that's normally used is cobalt and chrome-alloy. About 20 years ago, we thought that possibly titanium would be a better metal to use than cobalt chrome. Unfortunately, titanium articulating against polyethylene was a sub-optimal. So much so that all the companies that made it, eventually removed it from the market. The wear of polyethylene against titanium was too great. The plastic insert on the tibia can be supported by a titanium tray since there is no motion there. Many of the titanium femoral components had to be revised because of severe polyetehylene wear. At the beginning, when we first performing knee replacements, we didn’t know how long the implants would continue to function well. As such we did mainly those patients who had such severe disease that nothing else could be expected to work. Times have changed, however, We have seen that TKR is one of the most successful operation that is done in orthopedic surgery and that the implants last, and that pain relief continues. By the way the major reason for performing a knee replacement was, in 1973, and continues in 2002 to be pain relief. Knee1: Is arthritis the main reason for that pain? Dr. Laskin: Almost all the patients undergoing knee replacement have underlying arthritis as the cause of their pain. Relieving that pain increases their quality-of-life. Knee1: What physical restrictions come with total knee replacement? Dr. Laskin: You should not jog on artificial knees, because you can damage the plastic and loosen the implant. Likewise certain sporting activities such as high impact aerobics and singles tennis should be avoided. Dr. Laskin: (The) back and forth motion and the impact on the knee can damage the plastic. If the patient is willing to play an easy game of doubles tennis, that is usually possible. Likewise, what I tell patients now, is that if they could ski well before their knees became arthritic, and if they are willing to drop back a level or two, they can try skiing cautiously. I don't wanted them jumping moguls and I don't want them doing double-black diamond runs. Cross-country skiing and ice-skating are both permissible. I think that golf is a good sport for the total knee patient. Knee1: Taking out the wear-and-tear of aging and arthritis, if a person is healthy, why would you NOT do total knee replacement? Dr. Laskin: We're concerned about the wear of the polyethylene. When we studied polyethylene in the biomechanics laboratory, we’ve found that there is small, but real wear of the plastic with time. For the normal cobalt-chrome implant articulating with polyethylene, for instance, we can reasonably predict that the polyethylene will last 15 or 20 years. I actually have some 20-year follow-ups on my patients whom I operated upon in the late 1970’s or early 1980’s and they are still functioning well. Eventually, the polyethylene wears out, however. As it does, the particles of polyethylene may cause the implant to loosen. When operating on a 75- year- old patient, for example, one could reasonably expect that the implant was “last” for the lifetime of the patient. This may not be so, however, when doing surgery in the patient 60 years of age and younger. In these patients the polyetgehylen may wear out and if that happens, the surgery may have to be redone. I recently presented a paper in which I looked at the demographics of people coming here to Hospital for Special Surgery for knee replacement. How old were they? When we studied the decade 1980-to-1990 the average age was 72. years. For the decade 1990-2000, the average age was 69 years. Even more important than the average age was the fact that there was an increasing number of younger patients with advanced arthritis for surgery was performed. These were men who gave the story of various knee injuries during adolescence or young adulthood. As the years progressed, they developed degenerative changes earlier in life. Looking at the last 2 years we have found that the average age has dropped again to 67 years. Again we are seeing more and patients, both men and women, who have advanced arthritis earlier in life, often related to injuries such as ACL and meniscal tears. Knee1: What can I expect with total knee replacement. Dr. Laskin: When I started doing knee replacement in 1973, we keep the patient's leg immobile for four or five days. Why? Possibly, because we've thought if we moved it early, there wound be wound problems. When the patient then began knee flexion exercises on day five or six, it was very difficult, and very painful. There has been a marked change in the way that we have performed knee replacement since those days and now. In the early days we used general anesthesia, with all its concomitant problems. At present we at HSS perform almost all our knee replacements under epidural anesthesia, supplemented, in many cases, by a femoral nerve block. The epidural is left in situ for 1-2 days after surgery and connected to a patient controlled analgesia pump. As a result, the first few days after the operation are relatively pain free. We start the patient bending and straightening the knee on the day of surgery; they are able to do this because of the excellent pain relief afforded by the epidural and femoral nerve block. By the day after surgery they are bending 50-60 degrees and are allowed out of bed to walk. This expedited mobilization problem facilitates rehabilitation and decreases the potential for venous thrombosis. Back in the old days, we would make patients either bear in no weight on their legs or use a walker or crutches for six to eight weeks. It retrospect that really wasn't necessary. Now patients begin walking with walker on the day after surgery and by the third day, for the most part, they are progressed to a cane. By one month after surgery I allow them to drive a car. The recuperation time at present for a total knee replacement is about to two months. In the old days it was about four to six months. The hospitalization is different. In 1973, when I did my first knee replacements, we used to admit patients 2 days before surgery. In the mid 1980’s we changed to admitting them one day pre-operatively. In about 1990’s we changed to a program where they come into the hospital the same morning. We used to keep patients in the hospital for two weeks, primarily because they had such difficulty flexing the knee. In fact many of them required a manipulation of the knee to obtain motion. 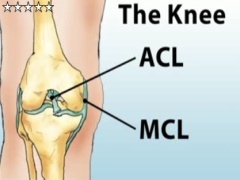 At present the average stay for total knee replacement is four days. By four days most people are ready to go home. We are able to use this type of hospital stay because we can control their pain well and that enables them to rehabilitate and achieve their functional milestones more rapidly. These patients are not discharged at this early stage because of some arbitrary decision of an insurance company, but because they have progressed to the point where they don’t really require hospitalization in an acute care facility. About 50% of my patients go home and receive further therapy there, while the other 50% will go to a rehabilitation facility for 10-12 days. Knee1: How have the implants, the technology of the new knees improved? Dr. Laskin: One of the areas that I have been working on for many years relates to prolonging the “life” of the polyethylene. The thing I have been doing with Smith and Nephew has been to try to prolong the. We have looked at the surface rubbing against the polyetehylene and have been using a material called oxidized zirconium rather than cobalt chrome for many of my surgeries. In the laboratory this material has a lower coefficient of friction than cobalt chrome, and resists scratching. These two factors decrease both adhesive and abrasive wear of the polyethylene. I've been using oxidize zirconium (Oxinium) for about 5 years since it first became approved by the FDA and have a fairly large number of patients. I have a randomized, double-blind study ongoing as well. I now use Oxinium in my younger osteoarthritic patients, and have had excellent success. We have also discovered, in our matched series study, that patients with the Oxinium component have a more rapid return of motion than the patients with cobalt chrome in our matched series. This has resulted in patients reaching their functional milestones earlier with the Oxinium implants than with the cobalt chrome femoral components. At two months, the range of motion between the two groups is equal, but the speed of regaining motion in the Oxinium patients has enabled them to leave the hospital at an earlier period than the cobalt chrome femoral component patients do. Dr. Laskin: If you had asked me last year, I would have expressed great reservation. At that time navigation required obtaining a pre-operative CT scan, and at surgery, inserting reference pins in the patient’s pelvis and ankle. The logistical considerations of performing the surgery at that time with surgical navigation added much time to the length of the surgical procedure. Things have changed however over the past year. At present, using a system called the Ion Navigation, no pins are required in the hip or ankle. Four small pins are placed near the knee and by using an image intensifier at the beginning of the surgery the position of the joints can be localized. This type of surgical navigation enables the surgeon to more accurately place the cutting guides. More importantly, however, they enable the surgeon to quantify the amount of stability or instability in the knee and guide him so as to have proper soft tissue balance at surgery. There has, in Europe, been a push to use the information obtained from such surgical navigation to allow an industrial type robot to actually make the bone cuts. My personal feel is that for knee replacement the use of a robot will probably not be necessary, since you see most of what is going on. It becomes more important in surgeries where there is limited exposure such as neurological or cardiac surgery. The use of a robot may become important for the operation called unicompartmental replacement, since traditionally the exposure there is quite limited. My personal feeling is that surgical navigation will become a standard within the next 24 months, and robotics may be used for special cases.